Here's what I'm up against now. 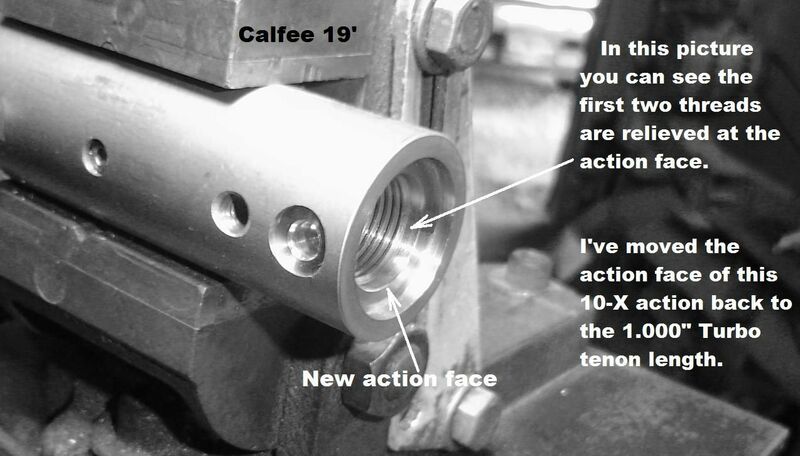 I moved the action face of the 10-X action I'm using for my new MD-PAS triple pistol back to the 1.000" Turbo tenon length. If I would have had any idea I was going to one day make a pistol out of this action, I would not have opened the counter bore up so wide. .900" diameter barrels are all that would ever be used, so I only needed to open the counter bore up to say .950" at the most. Therefore, since I opened the counter bore up much larger than I actually needed, I'm left with a challenge in putting the spacer on the front of the action to make it XP length, plus have a place for the recoil lug. And I'm still pondering exactly how I'm going to go about this.....although I believe I've got a basic idea of how I'm going to tackle it. CYA friends, this pistol is going to be spectacular, and hopefully the forerunner of the wave of the future. As you can see by this picture, I didn't have to make the counter bore as large in diameter as I did.. I "think" I'm going to attach the extension with four #4 screws....which means I have to drill and tap the narrow ring that's left of the original action face. Also notice the first two threads are relieved, as are all custom actions. If you use your imagination, the first two threads, right at the barrel shoulder, do nothing, because they're located in the relieve cut in the action. If you notice, I've also relieved the threads back about 1/4" from the breech face of the barrel, this so the extractor cuts don't get into the threads. On the 1.000" Turbo tenon, maybe slightly over half an inch of the threads actually contact the threads in the action, because the barrel threads are relieved at both ends. If Anthony DiOrio does wind up producing the V-3 XP pistol, he will have to have the recoil lug attached in some fashion. I've already discussed with him about having the V-3 XP tenon length be .875", then with a .125" thick recoil lug clamped between the barrel shoulder and action face, will still give us the standard 1.000" Turbo tenon length. Doing it this way is, of course, is his decision. I installed a rear screw in my XP stock by simply drilling a hole in the bottom of the rear of the stock and running a round head, Allen 1/4" x 28 up from the bottom, with the head of the screw purchasing on the bottom of the stock.. When I get this extension for this action properly mounted, very neatly, with the recoil lug also properly mounted, it will be down hill from there on. Last edited by Bill Calfee; 02-05-2019 at 01:07 PM. I believe I'm more cited by this pistol than I was 39 years ago when I built my first XP 22.....and believe me that's saying a bunch. There's a gentleman named Anthony DiOrio, who just may make a MD-PAS RFBR pistol available to the masses. And if he does, Big Time RFBR is going to get citing, big time. Anyway, the biggest hurtle I've got left to get over with my pistol, is lengthening it to XP length and providing a recoil lug for the trigger linkage. So today I did some doodling, and thinking. As of this minute, this is how I plan on lengthening the action. Why don't I simply attach the recoil lug and the spacer together with the four screws, instead of clamping the recoil lug to the spacer with set screws? Here's why: Because I made the counter bore larger in diameter than it needed to be when I moved the face of this 10-X action back to the 1.000" Turbo length. At that time I had absolutely no idea of the possibility of a MD-PAS pistol. A couple of positive things will come about anyway. The spacer will have a lip on it that fits into the counter bore of the action, which will give it great shear strength that a spacer simply bolted to the front of the action wouldn't have. So this is a plus.....although a pain to implement. The second plus is that I can now adjust the position of the recoil lug, before I tighten the set screws, so I have perfect alignment of the recoil lug for the trigger linkage, which is controlled by, and passes through, the recoil lug. This may turn out to be the most important thing I've done for the advancement of rimfire accuracy since I gave the world of accuracy the muzzle device back in the early 90's. If Anthony DiOrio can provide the masses with a MD-PAS RFBR pistol, the world of Big time RFBR will be shaken up like it's never seen before. Those "old salt" rifle shooters, and their one piece rests, couldn't stand to get beat by a pistol shot off a sand bag and bi-pod. But CYA friends, if Anthony DiOrio pulls this thing off, it's going to happen. Last edited by Bill Calfee; 02-05-2019 at 08:52 PM. By the way, the recoil lug also is used as a recoil lug, since the tang of the TCA action can't be used in a pistol, at least not a pistol using the factory stock. Even rimfires have to have a recoil lug of some sort. Anyway, after pondering all last night, and today, I've changed my mind on how I'm going to tackle this issue. CYA friends, this MD-PAS triple pistol is coming so perfect, that I simply can not mickey mouse it up now. I hurt myself when I made the diameter of the counter bore so large when I moved the action face back to the 1.000" Turbo length. But it's done, so I have to deal with it, without cobbing it up. When I get this issue resolved, properly, it's all down hill from then on. By the way, the barrel I'm going to start with, is the twin to the Broughton 4 groove on MERLIN. I had ordered two Broughton 4 groove barrels sized for pistols, which means the body of the barrels are .825" in diameter, with an enlarged breech end for the giant Remington thread of the XP action. I put one on MERLIN and have kept the other all these last 10 years......actually more like 12 years now. Will it be the ultimate barrel I wind up with on this new pistol? By the way, if this Broughton shoots like its twin on MERLIN, it most likely will stay. I remember Todd Wooten telling me after he won his PSL, that MERLIN was by far the most accurate and consistent shooting gun he ever worked with. So if MERLIN'S twin shoots as good, it will probably stay on my new pistol. Most folks probably forget that MERLIN'S barrel is only .825" in diameter. It gets back to the fact that we didn't test .900" x 24 barrels thoroughly and then decided they produced better accuracy than smaller diameter barrels. Anyway, I have to get my new triple pistol action lengthened properly. I still may wind up using this method.......but right now I believe I got an idea I feel better about, if, I can execute it without it being mickey moused. Last edited by Bill Calfee; 02-07-2019 at 04:19 AM. I've changed my mind again. My new MD-PAS triple pistol is coming along so nice, that I've got to get this extension on the front of the action perfect. 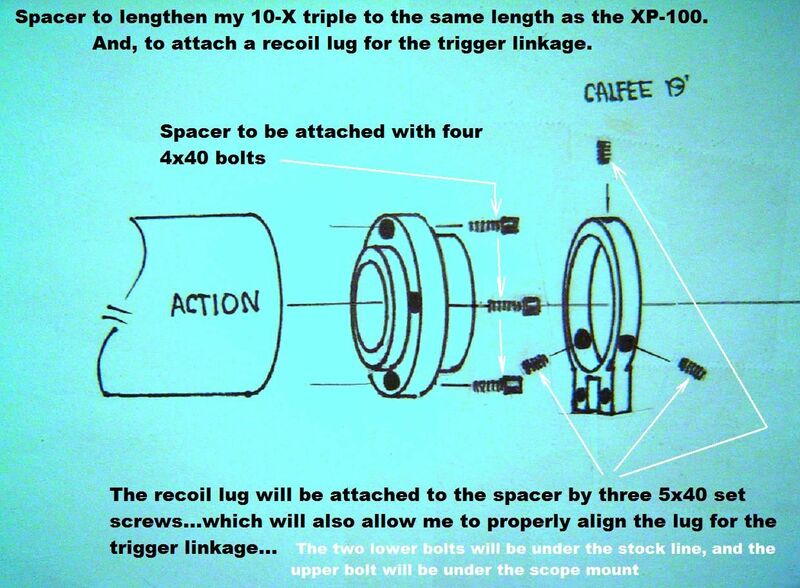 One of the things I really want, is to be able to adjust the recoil lug so the trigger linkage is perfectly aligned. I've decided to make one alteration to the way I propose in this doodle. I'm going to machine a shallow groove in the lip at the front of the spacer that the recoil lug fits over, and is clamped to. 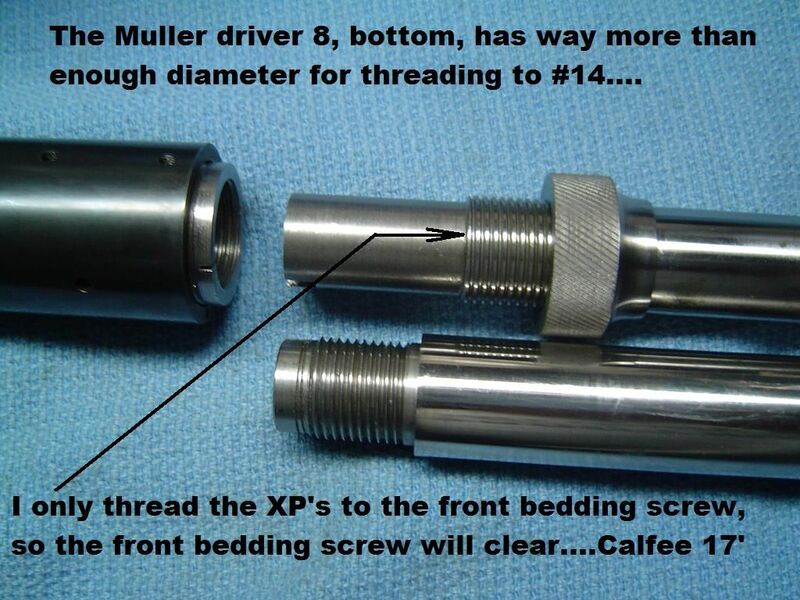 I'm also going to use 5 set screws instead of three to clamp the recoil lug to the spacer. The shallow groove I machine in the lip on the front of the spacer will allow the set screws to be slightly keyed into the lip. This will give considerably more security to the recoil lug........because it not only holds the trigger linkage, it's also a functioning recoil lug. This way I can adjust the position of the recoil lug to guarantee perfect trigger function.